Over the coming months we will be introducing our key-note speakers for The Playing Human Conference in London on 27-28 September 2018. 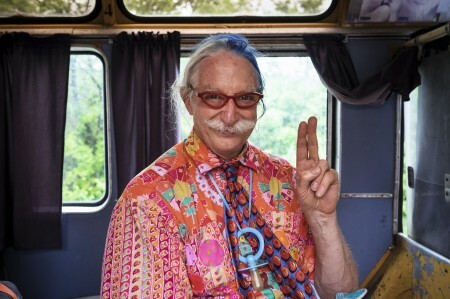 It is difficult not to fall in love with Patch Adams when he seriously proclaims, “I’m 72 years old with the maturity level of a 9-10 year old”. There is a warmth in his eyes when he connects with people in the room – connection that reached into your heart and touches your soul. If you read our newsletter you may already have met Patch Adams, Founder of Gesundheit Clinic – if you haven’t yet read our November Laughter News the link is ready for you at the bottom of this post. The Medical Doctor, who brought clowning to hospitals around the world through his persistent work to share, care, and love people instead of treat symptoms, is back in London at The Playing Human Conference! Patch speaks from his heart with a passion and honesty that makes me want to be a better person than I am, makes me want to reach out even further to create positive change. We need people in our lives who make us go the extra mile, people who inspire and call upon greatness in us all. In 2006 I had my first experience of Patch in Copenhagen and I was fortunate to be able to introduce him to a group of almost 100 Laughter Yoga Professionals in London in April 2017. However, for many it was too short notice to enable them to come to the event, so here is a second opportunity to meet and to learn from the REAL Patch Adams. The Playing Human Conference takes place at Conway Hall in London on 27-28 September 2018 https://www.unitedmind.co.uk/product-category/conferences/. This entry was posted in Laughter Conference and tagged business, catharsis, communication, compassion, conference, confidence, connection, family, festival, fun, gesundheit institute, gibberish, happiness, health, honesty, jeremy gilley, joy, laughter, laughter club, laughtertherapy, laughteryoga, leif hansen, linda leclerc, living, london, lotte mikkelsen, madan kataria, merv neal, multiple sclerosis, nonsense, pady oconnor, patch adams, peace one day, playing human, resilience, shonette bason, spark interaction, stressmanagement, teambuilding, unitedmind, wellbeing, world laughter day by Lotte Mikkelsen. Bookmark the permalink.